AT 7:06 a.m. Hawaii time last Sunday, Gov. Linda Lingle was sleeping at the Big Island's Mauna Lani hotel, Big Island Mayor Harry Kim was at home powerwashing his back deck and Maj. Gen. Robert Lee was about to land at Dulles Airport in Washington, D.C.
Then a powerful earthquake rippled out from below the ocean floor off Kiholo Bay on the Big Island's Kohala coast. The shaking was violent. Within 30 seconds, it was felt throughout the state. Another quake hit at 7:10 a.m., but already Hawaii officials were on their phones, calling one another and family members. Here's an account of those first hours. The powerwasher wand was on and in Kim's hands. "I was powerwashing and my wife yells from the house, 'Earthquake,'" he said. Kim turned off the powerwasher and then went into auto-pilot, his emergency routine developed during his 24 years as the former Hawaii County Civil Defense director. "I hate to say how mechanical I am, but immediately I told my wife, 'See you,'" he said. "I was out of the house and into the car before the quake stopped." The violent shaking woke Lingle, sleeping in a fifth-floor room. She was in Kona for an afternoon forum with her gubernatorial opponent, Democrat Randy Iwase. "I knew immediately it was an earthquake, because I had lived through them growing up in California. I went directly under the door jamb. I was moving quickly because I didn't get my glasses and I had to use my hands to keep my balance. When the shaking stopped, Lingle put on a robe and met her two deputy sheriff security guards, who righted a toppled television. "I called Lenny (Klompus, state senior adviser for communications) because I figured he would be getting calls." While talking to Klompus, Lingle felt another shock wave. Klompus reported feeling it about 30 seconds later. "I realized this had to be pretty big, I told the guys we need to evacuate immediately. There was no electricity, so I got my flashlight and threw all my briefing books into my suitcase and got dressed," Lingle said. 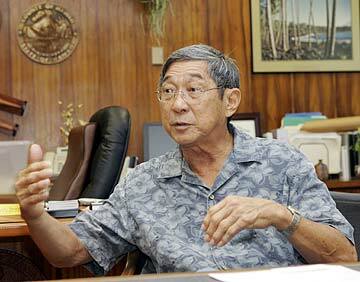 Big Island Mayor Harry Kim sprang into action after the first earthquake. His emergency routine developed over 24 years as Hawaii County Civil Defense chief. Ed Teixeira, state civil defense vice director, was hurrying to go to church. He already had received two calls that morning with updates on flash floods. "I got a call from my wife," Teixeira said. "We have a home in Waimea, and she said everything in the house was down. "I knew a significant event happened with violent ground shaking. I told her to hang in there and watch out for aftershocks," Teixeira said. He dashed out of his Tantalus home and started driving to the state's Emergency Operations Center at Diamond Head. Stuart Weinstein, deputy director of the Pacific Tsunami Warning Center, was half asleep. He lives in a house on the center's grounds in Ewa. "I felt a couple of jolts," Weinstein said. "The first one was kind of a bump and then later the house started to shake. "Then a couple of seconds later when I really felt the house shake, and then I knew that was the earthquake. And at that time I was putting on my clothes and running down to the warning center. "When you're dealing with an earthquake of this size, obviously there's a bit of an adrenaline rush because at this point you understand this is a very large earthquake," he said. "I knew this was probably at least bigger than a 6 (on the Richter scale) even before I got to the office." Kim got on the phone to the Pacific Tsunami Warning Center hotline, talking to Weinstein. "I was conferring with him in regards to magnitude, epicenter and the most important, tsunami threat or no tsunami threat," he said. "My words to him was, 'Have you made an assessment in regards to tsunami threat?'" He said, 'There is no tsunami threat.'" Weinstein said the tsunami center was readying an information bulletin. "The bulletin just said that this is a tsunami information bulletin and there's no warning in effect," Weinstein said. At the same time, Maj. Gen. Lee landed in Washington, D.C. His cell phone lit up with messages. "There was a message from Lenny Klompus, my wife and state Civil Defense emergency ops," Lee said. "My wife said the floor in our house was rippling." Lee then took calls from both the U.S. Army and U.S. Pacific Command, telling him there had been an earthquake off Kona and no tsunami was generated. "My first call back was to state Civil Defense and then Lenny," Lee said. Mayor Kim called a Hilo radio station. "I have a prepared text that I fill in. The master is very simple -- you close your eyes and you do it every time,"
He called the station and said, "Hi, This is Civil Defense." They reply, "'Hey, Harry.' Nobody calls me mayor," Kim said. The Tsunami Warning Center received a reading from a sea-level gauge at Kawaihae in Kona. "We recorded a 10- to 12-centimeter tsunami," Weinstein said. "It's very small ... it's roughly 4 inches or so. When it's that small, yeah, there was a tsunami generated but it's not destructive, so at that point there is no further action required as far as issuing another bulletin." Lingle was out in front of the hotel in a car with her security guards, who suggested that she move to the Kona police station. She called Bob Awana, Lingle's chief of staff, who was also driving to the Emergency Operations Center. While driving, Lingle reached Teixeira, who was heading down South King Street to the Emergency Operations Center. "I gave the governor some phone numbers and she gave me some," Teixeira said. In Washington, Lee called Lingle. They discussed the problems with what appeared to be a statewide power outage. "I ordered a National Guard C-26 to fly to the Big Island to pick up the governor," Lee said. "I also alerted our urban search and rescue teams throughout the state. The worst thing that can happen in an earthquake is collapsed buildings." Lee ordered a National Guard H-58 helicopter to survey the Kona area for Kim. At the same time, the C-26 pilot reported that the torrential rains made flying to pick up Lingle dangerous, and he suggested to Lee that Lingle get on the helicopter inspection tour. Lee called Lingle and also suggested they consider an emergency declaration. Lingle, at the Kona police station, was told that boulders were blocking roads and there was a need for bulldozers. Lingle called Lt. Gov. James "Duke" Aiona, who was on his way to the Emergency Operations Center. "He mentioned an emergency declaration and I said 'Absolutely,'" Lingle said. Lingle worked her cell phone, calling Teixeira and Awana. She found out that both Bob Matsuda, state Land and Natural Resources deputy director and Peter Young, Land and Natural Resources director, were in Waimea. Matsuda told Lingle he checked the North Hawaii Community Hospital in Waimea and that it was functioning on generator power. Lingle asked Young to meet her at the Kona police station to join in the aerial survey. Gov. 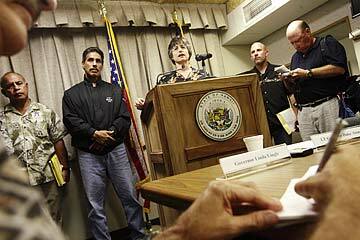 Linda Lingle held a press conference at the State Emergency Operations Center on Oahu following last Sunday's earthquakes. Lingle was on the Big Island when the quakes hit. "It was good he was with us. Of all the guys on the helicopter, one was a brand new DEA agent and the other two were from Hilo side. Peter was very familiar with the land and he could point out the areas we needed to check," Lingle said. At Diamond Head, Teixeira made sure his staff was moving through the prepared earthquake response check list. He checked that all the county emergency centers are running and listened to radio traffic from the Pacific Tsunami Warning Center, the National Weather Service and the four county police systems over the loudspeakers. By now, Kim was having trouble finding out what happened in Kona. "Obviously, we had tremendous problems in Kona because of downed power systems, repeater systems. In Kona, we could get through to only one functioning station, which is an AM station," Kim said. Lingle called in to KSSK radio in Honolulu. "I had already heard Rod Haraga (from) state transportation on the radio, so I called in and told them what I knew," Lingle said. "I thought it would be helpful because I was on the scene and I could describe what I saw and that it wasn't a scene of mass disaster." A National Guard helicopter landed next to the Kona police station, and Lingle started an aerial tour. She flew over Kealakekua Bay and then checked reports that the roof had collapsed at the Kona Wal-Mart. "I could tell there was no cave-in and no visible cracks, although we knew there could still be damage inside," Lingle said. At Diamond Head, Teixeira ordered up a "conference bridge," a video conference with all county civil defense agencies. "We could get three counties by video and had to use a telephone to get Mayor Kim," Teixeira said. By 12:30 p.m., Lingle finished her tour and flew back to Honolulu. She stopped to check on her two cats and change clothes. "The cats were very subdued; they weren't themselves," Lingle said.